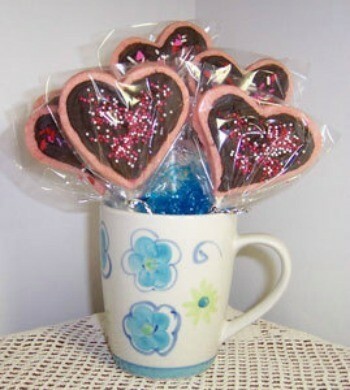 A cookie bouquet is very easy and thrifty to make yourself if you're looking for a special gift. You can order them online or at a bakery, but are extremely expensive. They range in price from $24.99 - $59.99 or higher. I chose a mug in place of a Valentine vase or a plastic champagne glass. Senior citizens are big coffee drinkers, and the person who wins this bouquet would more than likely throw out a useless container. Also I was able to buy 3 brand new coffee mugs at 49 cents each at a second hand thrift store. What kind of strawberry drink mix did you use for the cookies? Is it pre-sweetened? Nestle Nesquik contains the sugar already in the mix. I tried to buy an off-brand strawberry drink mix in one of the other grocery stores, but couldn't find it. So I had to buy the Nestle name brand. It gives the cookies just a hint of strawberry flavor, and it's not necessary to decorate them exactly as shown in the recipe. What are you putting in the bottom of the mug to weight it down and are you using wood skewers and where did you find them. I used a small piece of green floral block in the bottom of the mug to support the cookie bouquet. Also the bottom of the mug is quite heavy and won't tip over with the cookies inside. I bought a package of sucker sticks at a craft store. How pretty! They look delicious. Nice job!